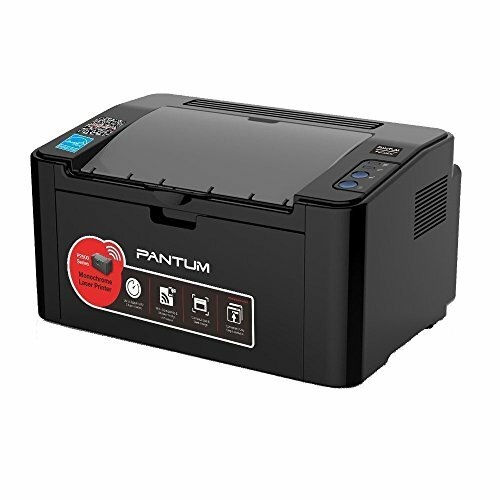 Compatible Cartridges: PB-210 (discontinued), PB-211, PB-210S Starter cartridge: 700 pages included Model: Brand: Pantum Model: P2502W Display: LED Print: Output Type: Monochrome Laser Technology: Laser Black Print Speed: Up to 22 ppm (A4), Up to 23 ppm (Letter) Black Print Quality: 1200 x 1200 dpi Time To First Page (seconds): 7.8 sec Print Languages, std. : GDI Duplex printing: Manual Max. Duty Cycle: Monthly duty cycle: 15,000 pages. Recommended monthly page volume: 700 pages Media Handling: Input Capacity, std. : 150 pages Output Capacity, std. : 100 pages Media Type: Plain, Thick, Transparency, Cardstock, Label, Envelope, Thin Media sizes supported: A4, A5, A6, JIS B5, ISO B5, B6, Letter, Legal, Executive, Statement, Monarch envelope, DL envelope, C5 envelope, C6 envelope, NO.10 envelope, Japanese postcard, Folio, Oficio, Big 16k, 32k, 16k, Big 32k, ZL, Yougata4, Postcard, Younaga3, Nagagata3, Yougata2 Ports: USB Ports: Hi-Speed USB 2.0 Connectivity Technology: Wireless 802.11b/g/n Hardware: Noise Level (Approx. ): Printing: 52 dB, Standby: 30 dB Processor(MHz): 600 Memory, std. : 128MB Power Consumption: Printing: Average 350 Watts, Ready: 38 Watts, Sleep Mode: Less than 6 Watts Compatibility: Windows Compatible: Windows Server 2003/Server 2008/Server 2012/XP/Vista/Win7/Win8/Win8.1 (32-Bit/64-Bit) Macintosh Compatible: Mac OS 10.6/10.7/10.8/10.9 Other: Linux Recommended environment: Temperature range: 10 - 32 degrees Celsius (50 - 90 degrees Fahrenheit) Recommended humidity: 20% - 80% Dimensions & Weight: Dimensions: 7.01" x 13.27" x 8.66" Weight: 8.82 lbs. Fast printing speed: print speed up to 22ppm (A4)/23ppm (Letter), up to 1200 x 1200 dpi resolution, 7.8 sec first print out time. Wi-Fi Direct and Mobile Printing for instant results from anywhere in your home or office. Standard Interfaces: Wireless 802.11b/g/n and Hi-Speed USB 2.0 interfaces. Savings with every page: 700 page starter cartridge included. 15,000 page duty cycle for higher printing volume. 150 pages paper input capacity. Save more than space: Sleek design and compact size fit nicely on any workspace. Automatic sleep mode to conserve energy and promote savings. If you have any questions about this product by Pantum, contact us by completing and submitting the form below. If you are looking for a specif part number, please include it with your message.